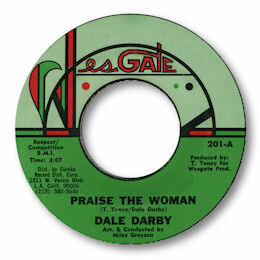 Los Angeles vocalist Dale Darby made one almost perfect track entitled Praise The Woman. His screaming, heartfelt vocal is so full of passion that it almost leaps up out of the grooves when you spin the 45. The horns are well up in the mix adding power to Darby’s performance and he is backed up by a righteous female chorus. His howling at the run out is especially electrifying. 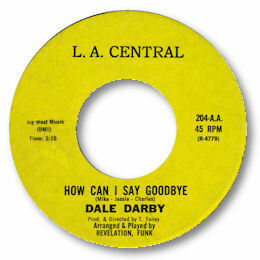 Darby is so convincing on this cut that it a puzzle – and a shame – that he never recorded anything like as powerful again. He tried funk such as “Treat A Woman Right”, “Push It Up Baby”and “Back Street” and he sang dancers such as “Let’s Get It Together”. But only the gentle beat ballad How Can I Say Goodbye comes anyway close to matching the impact of “Praise The Woman” – and it doesn’t come very close. Perhaps it was the involvement of the excellent Miles Grayson on "Praise The Woman" that made the difference. "they entirely steal "how can you say goodbye" from the Heartbreakers on Derby, exactly the same song. Also, the credited backing band Revelation Runk is the ohio group who recorded on Bear Cat and Gold Plate. They moved out to LA by that point and appear on Dolemite"
As always I'm grateful to Bob for sharing his vast knowledge.